Would you like to know when Lisa posts new patterns? Sign up for the mailing list! These classic clog style slippers fulfilled many requests from customer. A favorite easy to wear style, these slippers can be slipped on and off easily yet still keep your toes warm and cozy. 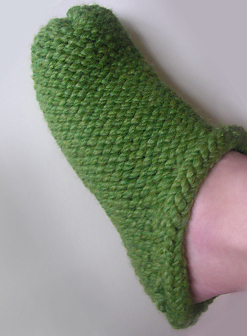 The slipper pictured is made using Lion Brand Thick N' Quick yarn in color "Grass". Color photographs and detailed written instructions are included in the pattern.